Long awaiting is our updated Nomad tent, which boasts all the great features of our Original Nomad, PLUS some extra. The ideal companion to any road warrior, the Nomad Tent is for the traveler who doesn’t want the weight of a stand-alone tent, but doesn’t want to sacrifice comfort and rely on a heavy tarp. The Nomad is a no-pole, single-wall tent, made with lightweight waterproof nylon upper, a heavy and durable waterproof polyester base, and mesh entries at both sides to allow air to flow through when the heat rises. 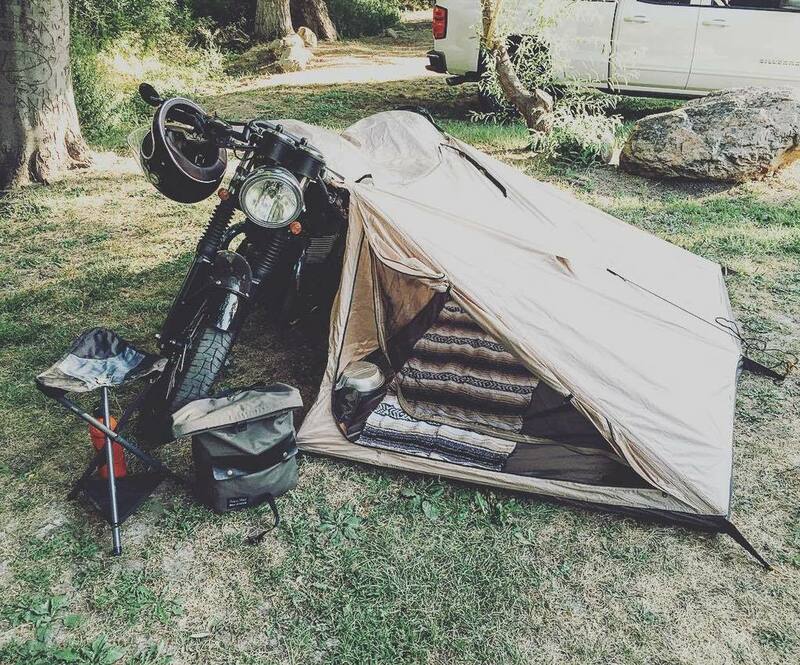 Our unique patent-pending design secures the tent to your bike, utilizing the high points on your motorcycle to raise the tent crown, and give you (and a possible companion) an ideal resting place for a night. When you find yourself in unstable conditions, we have included an aluminum kick stand plate to give your motorcycle extra stability.